It all started in 1991, after I sold my luxery bathroom/kitchen company Bathrooms or Bournmouth in 1991. A new smaller business was established 6 months later, with a focus on energy and water saving technologies. Not coming from a plumbing/heating industry, but through the bathroom business, more and more buyers wanted power showers, which began with boaster pumps, but unvented hot water cylinders and Combi boilers were becoming available in the UK. It was during a unvented plumbing course through Barking Grohe in London, that I was shown a copper cylinder which provided hot water at mains pressure, but with a safe open vented cylinder. The NEW cylinder was launched soon after, but failed to attract buyers after complaints about running out of hot water. I contacted the copper smith who produced the heat exchanger coils; to develop my own idea of a cylinder which could deliver hot water at mains pressure safely by using UK manufactured copper cylinders. The first design (pictured on the left hand side above, used a 180L combination cylinder, but used the water storage part at the top for the duel coil to be located in. The concept was very simple, but to the majority of the plumbing/heating industry I tried to convince at an exhibition in 2002, 2003 could not grasp how it worked. A circulating pump on the outside with a flow switch, starts and stops the heated water in the store circulating through the outer copper coil (1 inch) once a tap or shower valve is turned on. 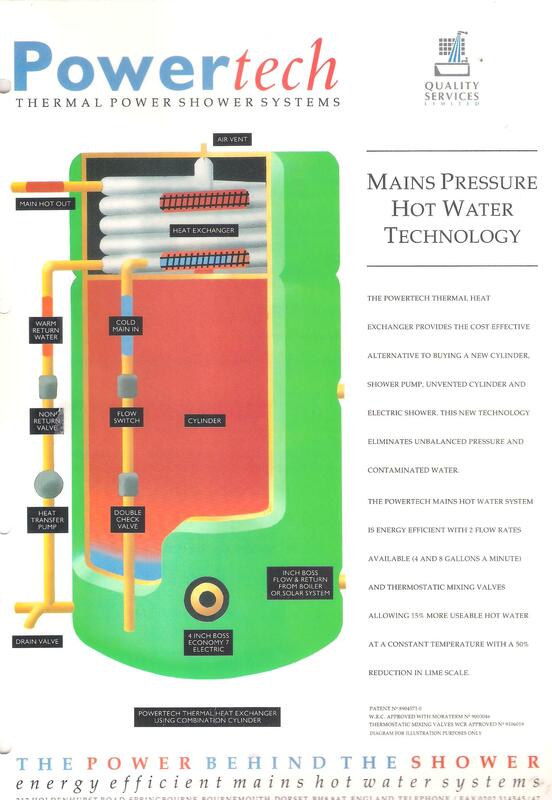 Cold mains water passes through the inner finned coil from the opposite end, so the hottest water from the cylinder, heats the delivery of water passing out to the taps. The problem was always in winter months, when the cold water mains dropped from 15c in summer to 5c in winter, 4c in Scotland, which resulted in the increasing the water temperature in the store, which was direct. This is when I started to look into solar water heating collectors, as a pre heat of the mains cold water prior to passing through the copper coil heat exchanger. After establishing a manufacturing facility in Cyprus in 2008 after shipping a 40ft container in 1993 and moving to Cyprus to complete further research and testing, I returned to the UK to established The Global Warming Solution Centre in WestParly, Dorset. A new copper cylinder manufacture was found in the UK to share all my new design changes with, but always heated by solar water heating collectors, backed up by a gas/oil boiler or emersion heaters and heat pumps. From success of my commercial thermal stores in Sth Africa from 2014, my designs changed again and switched from copper to stainless steel, made in China up to 500 litres. I then contacted World Heat in Manchester and after a meeting with the directors, agreed to start marketing my new thermal stores. 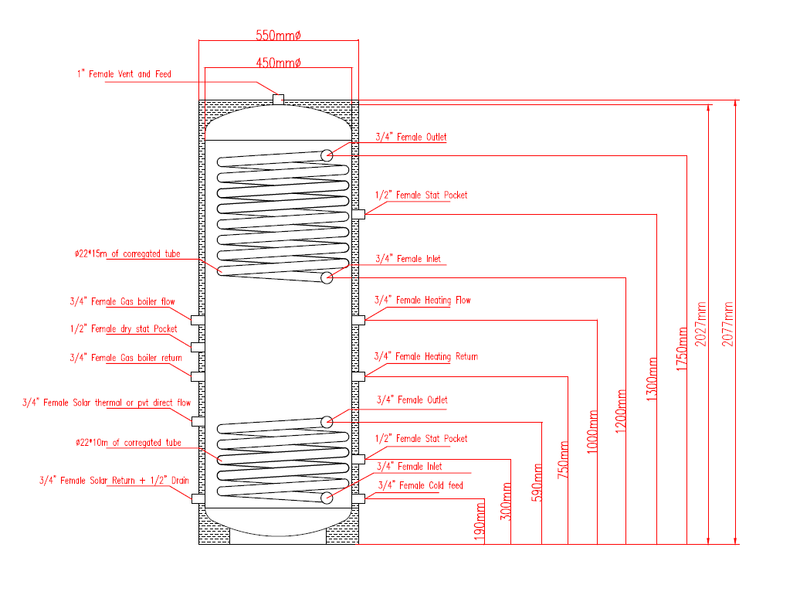 The 2nd picture a schematic of a 250-300 litre thermal store, with the 3rd picture with a square box casing, sold to a builder/developer in Cambridge in 2016. A 30 tube heat pipe collector is the tax free heat into the store, with a back up of a wood burner back boiler and a gas boiler. Unlike the early thermal stores in 1991, Thermal Stores today, provide space heating water from the store as well as hot water at mains pressure through the 2 internal stainless steel corrugated coils suspended on the stores none potable water. 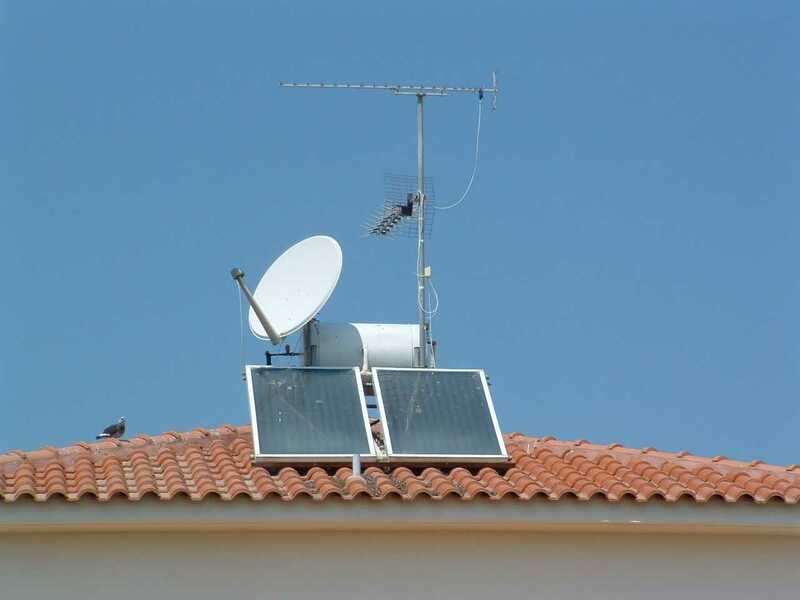 During my 5 yrs in Cyprus, which began in Paphos and ended up in Nicosia, was to learn all about the failures of solar thermal hot water systems across Cyprus. The picture on the left shows how condensation inside the box affects the glass. This is a Combi solar system, with a pressure cylinder, with cold water storage in the basement pumped through the cylinder. The next one, is a Combi SWH system, but with the cold tank above, no pumps and open vented. But lime scale was a big problem and destroyed the copper exchangers inside the flat panel boxes, which within a few years reduced the heating of hot water by 80%, only worked in the height of the summer, with emersion heaters used in winter months. The last picture, is the testing of a Japanese 2 meter tube collectors I imported from Japan, alongside my first solar collector I designed and developed in the UK in 1992. 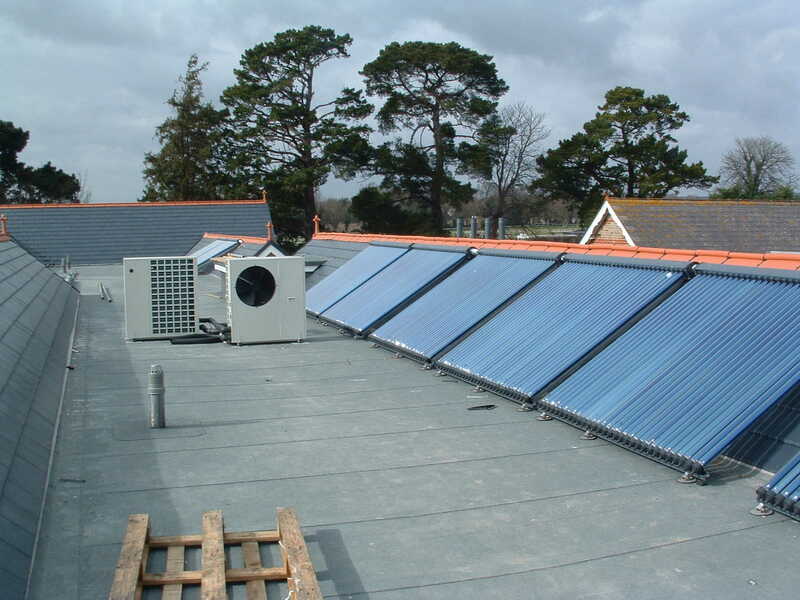 This 20 x 30 tube collector installation on the roof of a care home in Sussex/UK, was plumbed into the two 1500 Liter open vented thermal stores made from copper sheet and foam blown spray insulation. 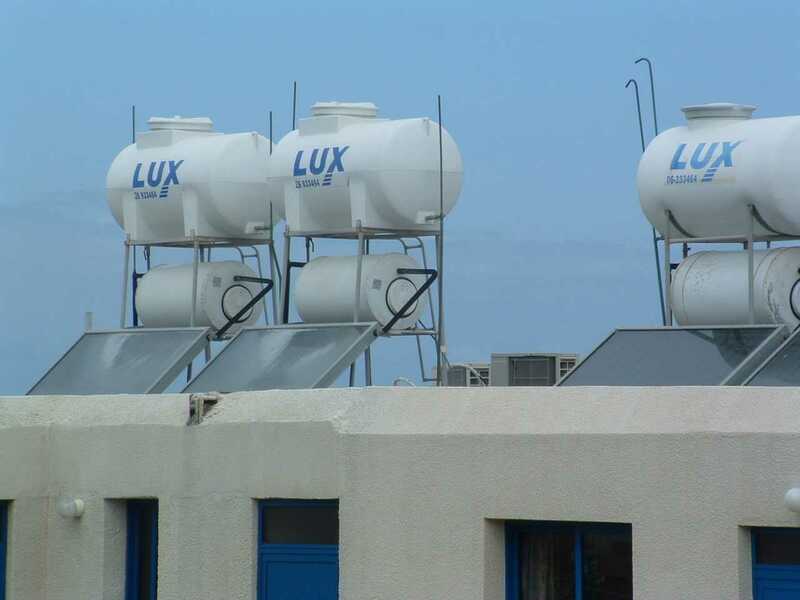 The majority of failed solar water heating (SWH) systems was caused by lime scale due to the same potable water being in the water tank and the flat plate collector. Both these countries used bore holes and resorvoirs for there water which has heavy lime deposits. As the cold water heats up in the copper exchanger thermal collector, the lime starts to coat the internal part of the 12mm copper tube behind the glass. Within 2 yrs the potable water flow through the collectors had almost stoped flowing. As much as I came up with a solution to solve this issue through a water conditioner, the local cyprus SWH industry was not interested as there survival was replacing collectors on a regular basis. 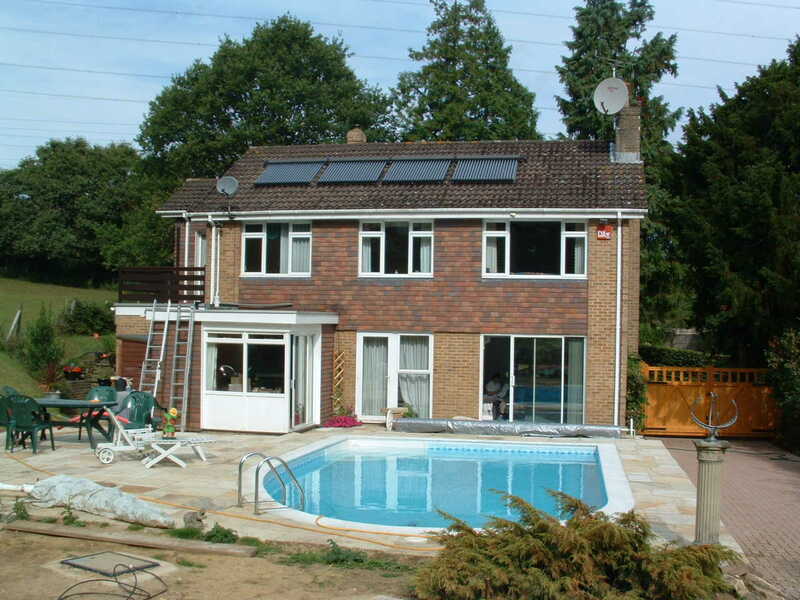 For those with a swimming pool, a larger solar thermal heat pipe array is the perfect choice, that provides both space heating support and hot water throughout the winter, with the excess heated water to heat the swimming pool, through a 3 way zone valve. The solar heated thermal store water of 300 liter is circulated through a pool stainless steel tube heat exchanger linked to the pool filter/pump equipment. This was one of 20 new homes being built by a British property developer in 2003, who asked me to supply mains pressure compact thermo-siphon systems with evacuated tubes. 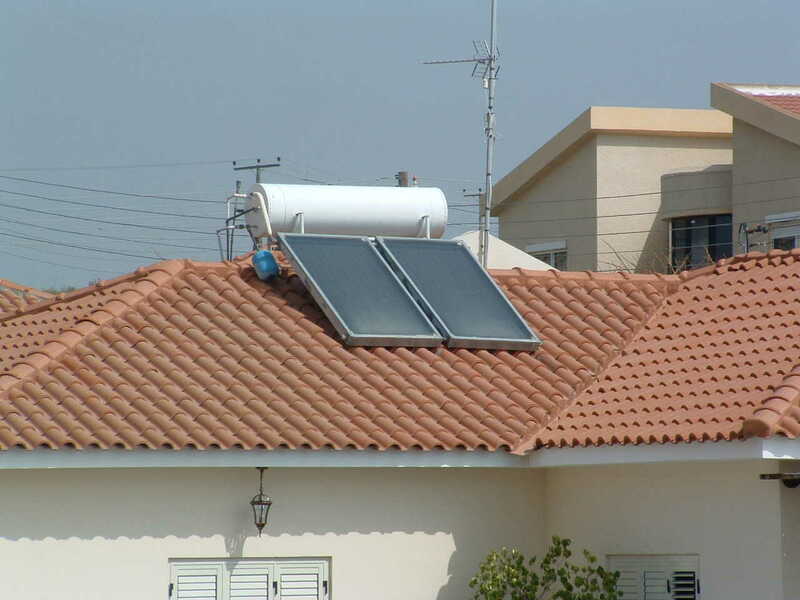 The cold water is pumped from a cold water storage tank located in the garden to the solar pressure tank on the roof. An expansion vessel was also included to limit the water pressure in the solar tank when nobody draws any hot water from the solar system at the height of the hot summer. 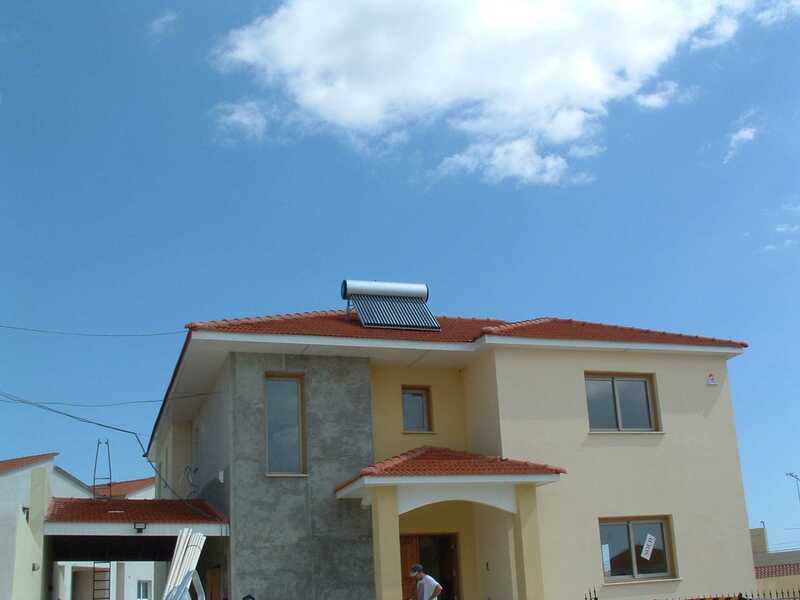 The majority of my knowledge and on hands solar water heating installation experience started in Cyprus from 1993, after selling my luxury bathroom/kitchen and property refurbishment business in 1991. 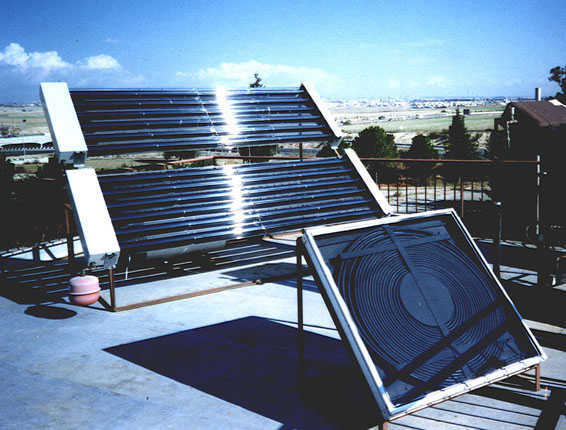 My research in solar water heating collectors started 1991 after I designed an alternative to a pressurized hot water tank, we called a Multi Fuel Thermal Store, made of copper sheet and foam sprayed insulation. 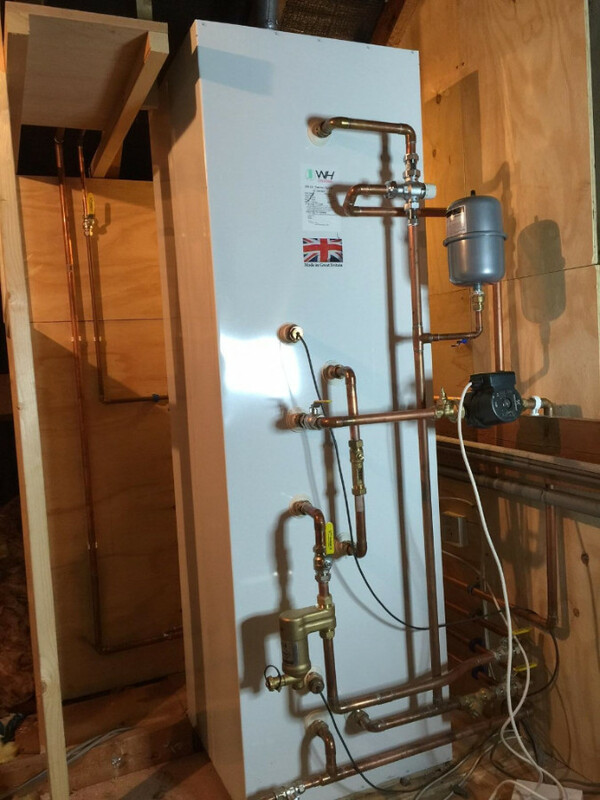 After working with a copper smith to produce my design, i started to make some early sales, but as soon as the mains cold water temperature dropped to below 8c the thermal store was found to under perform. The full details of thermal stores can be found under another link. My decision to set up a new business in Cyprus came about after taking a much needed holiday in 1992, followed by two more visits and finding a British person married to a Cypriot working as a plumber. In 1993, I packed and shipped a 40ft container of a varied mixed range of products to be unloaded into a rented shop in Pathos. I had planned to be there for 6 weeks setting up the showroom with my own solar collector on the flat roof, with a imported batch water heater with glass tubes on the front of the shop after building an extension to the shop front that represented a UK pitched roof. In those days, there was no digital camera, only film type, which is why I have no early pictures to show, until 2 yrs later.